How can you resist this Chinese New year offering, seethed with red dragon fruit for taste and colour, and stuffed with chewy mochi or nian gao? The filling makes it all the more special as it’s made in-house using black sugar, fried shallots and lightly candied yam and sweet potato; for contrasting taste, you also get fluffy pork floss and salted egg. Available during the Chinese New Year period. Please email sweets@sugardaddy.com for orders and enquiries. It’s best to include this yam cake in your bountiful spread, as it signifies “going upwards in the year ahead”. As it’s from Peranakan doyenne Violet Oon, you’re assured that it’s delectable, too. It’s the true definition of savoury with the yam bedecked with dried prawns, Chinese sausages, dried mushrooms, minced pork and five spice powder. After it’s steamed, the ensemble is garnished with chillies, spring onions, coriander leaves, and deep-fried shallots. Available from January 22 and an advanced order of 2 days is required. Please call 9834 9935 or email eat@violetoon.com for orders and enquiries. If the bak kwa isn’t indulgent enough, Hock Wong creates a bacon version you need get your hands on now before it runs out. What looks like a 20cm bacon strip is actually premium pork belly that has the perfect ratio of sweetened meat and luscious fat. Each strip is carefully roasted for a caramelised and slightly charred finish. Available now while stocks last. Please click here for orders and enquiries. Take a break from all the feasting and have this delicious morning pick-me-up. It's no ordinary coffee as Singaporean influencer Bella Koh was inspired by the season to craft this drink using ingredients commonly found in CNY dishes. It’s a delightful mix of Arpeggio coffee and soymilk garnished with five spice, gold leaf and dried mushroom. It's also available at all Nespresso boutiques on January 19 and 20. 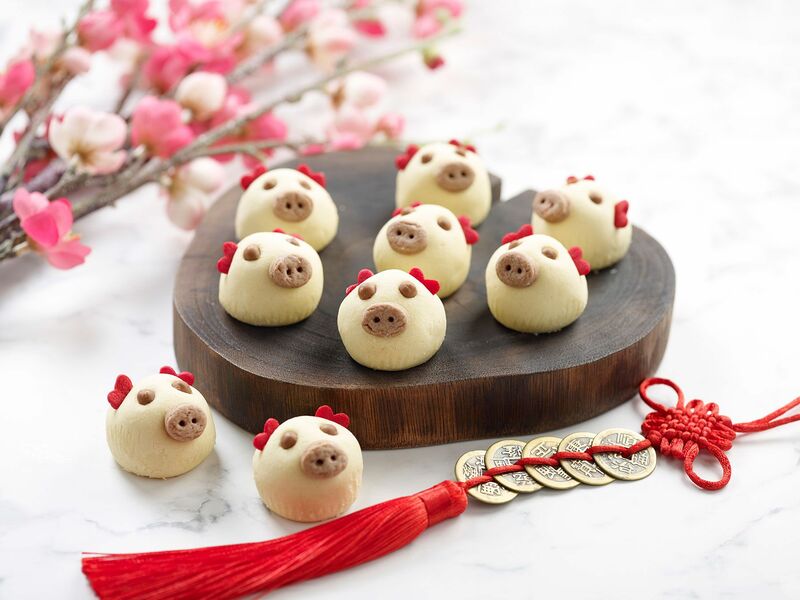 The crowd favourite pineapple tarts have been given a makeover to look like charming piglets for a prosperous New Year. The soft, flaky crust gives way to a sweet and addictive pineapple jam, making for perfect for gifts or for your own indulgence. Available from January 19 to February 19. Pastry queen Janice Wong didn’t stop short of presenting us with a galore of Chinese New Year confections to gift your family and friends. We’re particularly interested in this hamper containing an assortment of cookies; flavours include strawberry love letters and pineapple flower tarts, as well as kueh bangkit (coconut biscuit), spicy shrimp roll, round pineapple tarts and green pea biscuits. Available from January 7 to February 19. If you’re tired of your usual confections, you should give this a go. What makes it desirable is the moist pandan chiffon core and an elaborate glaze of red yuzu mousse with swirls of orange sauce. Available from January 14 to February 25. Please call 6408 1288 or click here for orders and enquiries. Here’s another rendition of the popular pineapple tarts we can’t get enough of this season. Each piece of buttery short crust pastry is flavoured with an aromatic, earthy earl grey tea leaves, and gives way to a generous filling of homemade pineapple jam—with a hint of lemongrass. Available at Sprmrkt’s outlets from January 21 onwards. Please call 9736 4032 or email contactus@sprmrkt.com.sg for enquiries and orders.